Due to political pressure to reduce fuel consumption and CO2 emissions, many carmakers are working on technologies to make their models more efficient and cleaner. According to an article published by Auto, Motor and Sport Sweden, the 2013 Lamborghini Aventador will come with cylinder-deactivation technology. The technology works by cutting down cylinder operation from firing twelve pistons to just six, effectively making the 6.5 liter V12 temporarily a V6. When the engine’s full complement of cylinders is needed, all of them operate normally. But when the car is cruising, shutting down several of the cylinders ensures an improved fuel economy and less emissions. The cylinder-deactivation technology will be paired with a start-stop system, which automatically shuts down and restarts the engine to reduce the amount of time the engine spends idling, thereby further reducing fuel consumption and emissions. When the accelerator is hit, the system will kick in within 180 milliseconds. In true tradition of weight saving, Lamborghini opted for a capacitor instead of a battery which saves about 3kg (7lbs) to power the start-stop system. A capacitor is an electronic device that stores electric energy. It is similar to a battery, but is smaller, lightweight and charges up much quicker. With these upgrades, fuel economy will improve from the current 17.2L/100km to 16.0L/100km. Emissions are also set to drop from 398g of C02/km to 370g/km. The 2013 Lamborghini Aventador will feature a few other modifications, these include stiffer springs and retuned dampers to enhance comfort, some changes to the instrument cluster with enlarged numbers on the gauges, improved switches and variety of carbon fiber accessories. 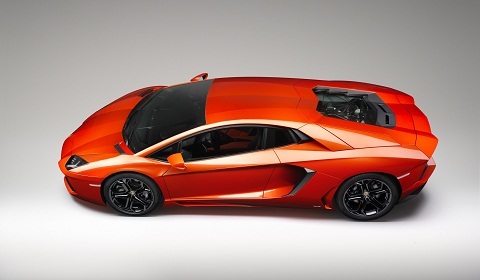 The updated Aventador is expected to be unveiled at the Paris Motor Show this September.